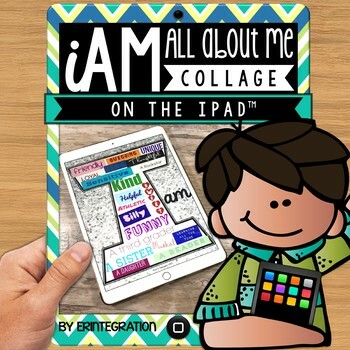 All About Me iPad activity using the free app Pic Collage or Pic Collage Kids. Easily integrate this low prep iPad® mobile digital device app activity into your classroom. Students will first use the included QR code to download a blank letter "I." 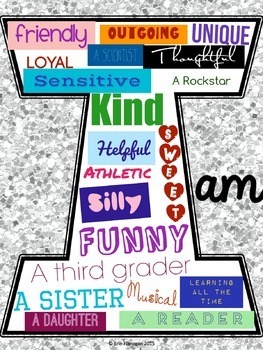 Next students will follow the included directions to set the image as a background and add describing words that tell about themselves using the free iPad app PicCollage™. While doing this activity students will learn how to use QR codes, how to pinch and drag and icons for saving and downloading - the perfect way to introduce iPad use while having fun! ★ 4 student friendly step-by-step visual direction pages for completing the activity independently. ★ 1 QR code that links to a set of 10 blank letter "I" images with glittery backgrounds. Also includes a transparent image so students can choose their own background in Pic Collage. You will need the free app Pic Collage™ and a QR reader app.